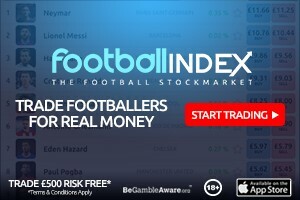 Here’s our fantasy premier league defender tips GW14 article where we give our defender and GK player rankings for gameweek 14. There’s a comprehensive table of stats and player suggestions to help you make a transfer choice. 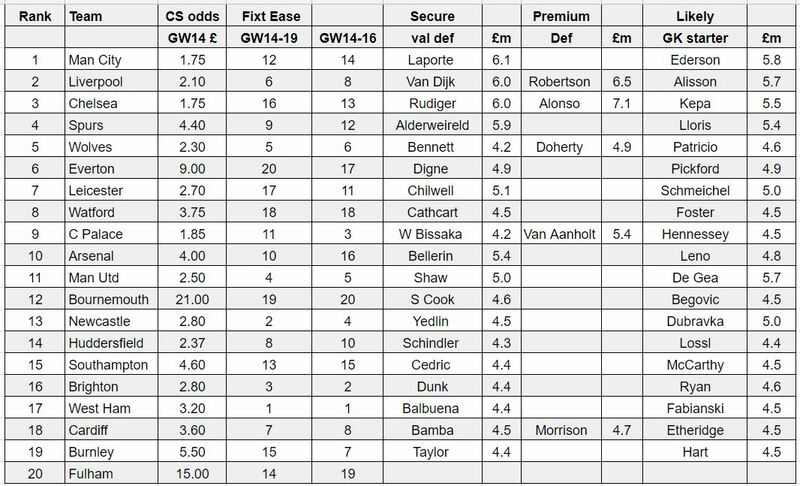 bookies odds for a clean sheet for GW14. The lower the better obviously. Here were trying to find a good defensive team with a good transfer entry point and reasonable ongoing fixtures as the basis for suggestion. Still the best defensive team for me in all categories. The Mendy injury takes away their main attacking threat. Laporte probably has the most gametime security but seems to have only moderate attacking potential and little bonus potential. Stones is your cheaper risk option but as you see from the West Ham game susceptible to the competition from Otamendi and Kompany. The LB position could be either Delph as we saw v West Ham or Zinchenko as we’ve seen v Lyon. 2nd only to Man City as a defensive unit. There are a number of options although with different factors in the decision making to grapple with. Starting with the most expensive is LB Robertson. He’s probably the best option from an attacking and a bonus point of view but he’s not immune from rotation and he’s £6.4m. The next option at £6.0m is Van Dijk who is probably the most gametime secure given his leadership requirements and the less ground covered as a CB. The 2 cheap options of Gomez at £5.1m and Alexander Arnold at £5.2m are the most rotatable and come with that gametime risk for the price. It’s easy to dismiss Chelsea after the defensive shambles that was the Spurs game but if you look objectively at the stats they deserve their position as the 3rd best defensive side. The fall out from the Spurs loss could be David Luiz who had a particularly poor game which is why I’ve upgraded the cheap option to Rudiger. Alonso still has the best underlying attacking stats of any defender but you pay a significant premium for that. Like Chelsea it’s easy to dismiss them as a defensive option after the equally disastrous loss to probably the worst attacking team in the league. However again apart from maybe conceding more shots per game than you’d like their defnsive stats are up there with the best. Particularly when you consider that you get one of the better attacking defenders in the PL in Doherty or you can get a fairly secure defender for £4.2m. However there’s no doubting the enormity of the loss to Huddersfield and the manager was particularly scathing of his team so their is a gametime risk attached to the defence if he makes changes as a reaction. Crystal Palace have navigated through their tricky fixture period and there aren’t many better entry points for a transfer than Burnley at home. Van Aanholt is undoubtedly the attacking option although it isn’t really based on his underlying stats or his return of 1 goal and 1 assist in 13 games. Wan Bissaka at £4.2m is worth the difference in price for me especially since he is on 9 bonus points. He’s got 3 bonus in 3 of their 4 clean sheets this season. 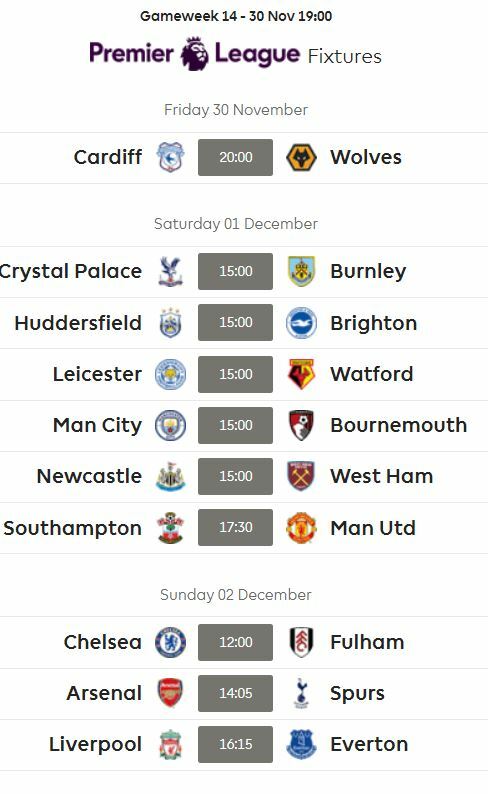 its those Premium GKs vs the 4.5m brigade – is it worth paying the extra >1m and why, and how past and upcoming fixtures affect things. e.g. fabianksi is close to a price drop after just 1 clean sheet, but WH’s fixture list is at a massive turning point, and their ranking in your list might be distorted. Hart looks good value on the face of it but his PPm is propped up by a penalty save and recent clean sheet. I’m strongly considering a move into one of Fab/Eder/Alisson but would really welcome your thoughts!